I should let Philadelphian epic doomers Crypt Sermon crawl out from under their epic doom influences. So far, I haven’t. My Black Market blurb about them, like a lot of other write-ups, was too quick to namecheck epic doom designers, namely Black Sabbath, Candlemass, and Solitude Aeturnus. Shame on me. In my defense, distilling a style down to a RIYL sticker is efficient and effective, even if it’s the GPS of hack music criticism. Crypt Sermon’s proud, chugging struts certainly do bring to mind post-Ozzy Iommi; singer Brooks Wilson soaks up the spotlight with “Samarithan“-esque belting; and the giddily high-flying solos streaking across tracks like contrails recall “Seeds Of The Desolate.” These touchstones ultimately work because Black Sabbath, Candlemass, and Solitude Aeturnus are keystones in the metal maturation of many. Plus, using those bands as shorthand is rarely intended as an insult. You could do a lot worse as far as points of reference go. But using the past as the persuasive argument sells Crypt Sermon short. Sure, debuts are likely to be heard first as history, but Out Of The Garden deserves a second listen since it’s more than a museum exhibit. 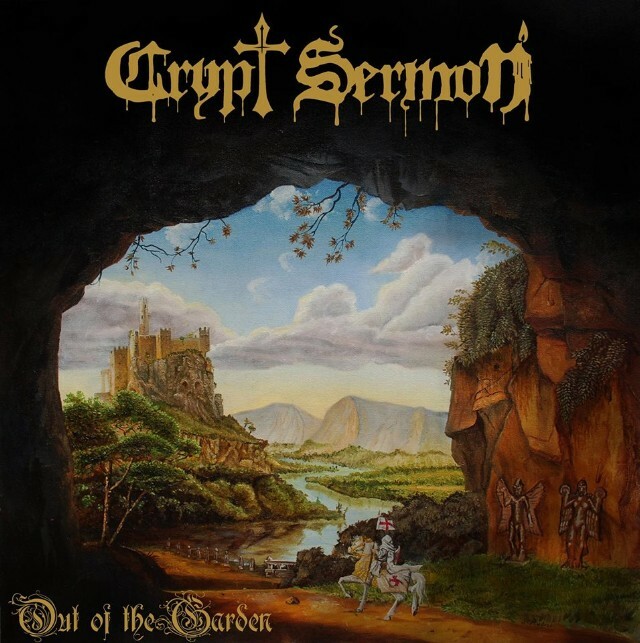 And, unlike how shambolic rethrash or +1-wave black metal can unwittingly tumble into originality, Crypt Sermon’s achievement isn’t by accident, either. This desire to roll away from the family tree has been on the quintet’s mind for a long time. In between the release of their well-received 2013 demo and this debut LP, they seemed to sense my kind of bad-writer quickie-compartmentalizing was in their future, telling Lemurian Litanies, “I think we will start bringing a bit more to the table and develop our sound a bit. After all, Candlemass didn’t become Candlemass by merely copying Black Sabbath!” Good answer. That should put things to rest, right? However, it’s still gnawing at them. If the above response wasn’t a bullseye, guitarist Steve Jansson tried to split his arrow while making the media rounds recently. To Decibel: “I think that people are finally just getting sick of the myriad of Sleep and Electric Wizard clones that have been at the forefront over the last few years. I certainly know that I am, and Crypt Sermon was basically started as a reaction to all of that.” Great answer. And therein lies the keen insight pushing Out Of The Garden’s seven songs past mimicry: Crypt Sermon isn’t reenacting; rather they’re reverse engineering. They’ve cracked the code and reapplied the rules of epic doom to modern compositions. Crypt Sermon compositions. So one of Out Of The Garden’s pleasures is hearing how the band checks the boxes — the things making epic doom epic doom — while making the sound work for them. Sure, this is how everything evolves, but considering metal has a propensity to act like a vending machine, it’s nice to point to a group doing it for real; especially since the group is doing it without erasing the rules altogether. A song like “Byzantium” makes this point more clearly. I mean, “Byzantium” is familiar. It is, through and through, the same epic doom of Leif Edling’s creation. Brook Wilson’s biblical lyrics tower above the trudge thanks to Wilson’s soaring singing. Jansson and fellow guitarist James Lipczynski contrast slow-motion-apocalyptic riffs with tasteful shredding. Bassist Will Mellor and drummer Enrique Sagarnaga drive home time-keeping spikes like John Henry. Or, more or less, same as it ever was. But “Byzantium” is so goddamn smooth, and that’s due to songwriting chops and genre fluency. Rotoscoping clones are more concerned with karaoke. Crypt Sermon? They want the best standalone song. Put in motion by Jansson’s gliding lead and Lipczynski/Mellor’s path-clearing trudge, “Byzantium” just doesn’t stop. Its flow is seamless, its push/pull engaging. “Byzantium” is one of the easiest and quickest five minutes you’ll enjoy this year. How’d they pull that off? Well, Crypt Sermon have tailored their style to their skills. They’re not Black Sabbath, Candlemass, or Solitude Aeturnus; their dimensions are different. Thankfully, they know that. That self-awareness helps them to avoid wearing their influences like a teenager wears his dad’s suit. But the group also knows they really, really like Black Sabbath, Candlemass, and Solitude Aeturnus. After all, those are the bands that taught Crypt Sermon how to be Crypt Sermon. Out Of The Garden is out 2/24 via Dark Descent.